Wordworks Policy Briefing 2 – Early language and literacy: What skills and understanding do young children need? “From birth, every child should have access to high quality learning opportunities for language, literacy and mathematics. These should be available in all early years settings, including the home, and facilitated by parents and ECD practitioners who are equipped with the right knowledge and resources”. It explains what is meant by ‘early literacy’ and discusses early childhood as a unique developmental period for language and literacy. Since literacy starts with language, the brief then explores the role of early language and the importance of wider skills for learning. 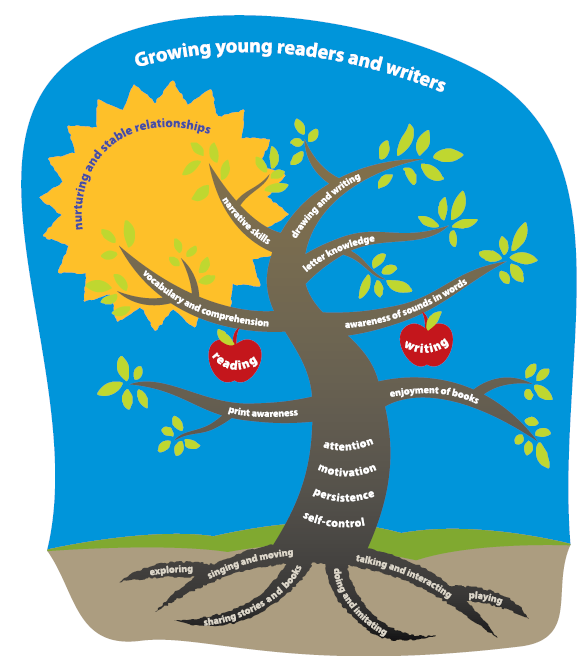 It provides a useful table on the seven strands of early literacy, which is followed by a colourful diagram illustrating how we can grow young readers and writers.